Description: Fine map of Northamptonshire from the Second Edition of Speed's seminal atlas, 'The Theatre of Great Britaine'. Inset maps of Northampton and Peterborough. Coloured. Description: Northamptonshire. A decorative map from the second edition of Speed's seminal atlas, 'The Theatre of Great Britaine'. Showing vignettes of Northampton and Peterborough. Description: Early miniature map of Northamptonshire. Coloured. 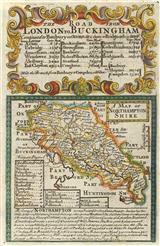 Description: Early county map of Northamptonshire with attention to its major towns and villages. Coloured. 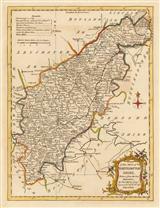 Description: County map of Northamptonshire orientated west to east. The very elaborate dedication on the lower left is to James Compton, 3rd Earf of Northampton, politician, soldier in the English Civil War on the Royalist side and later Constable of the Tower of London. Description: Charming miniature copper-engraved map of Northamptonshire. Coloured. 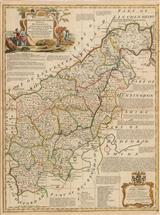 Description: Decorative early county map of Northamptonshire. Coloured. Description: Charming miniature road map from Stratford to Derby, via Northampton and Leicester. Coloured. Description: Charming miniature map of Northamptonshire with table of distances on the roads between London and Buckingham. Coloured. Description: Attractive map of Northamptonshire surrounded by illustrations of artefacts found in the county, including fossils and a Roman mosaic pavement in Heyford. Coloured. 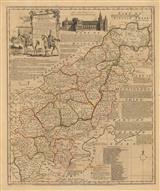 Description: Magnificent large map of Northamptonshire with farming scene cartouche and surrounded by descriptive text. Coloured. Description: Detailed county map with the road network and latest border configuration. Coloured. Description: Attractive copper-engraved county map of Northamptonshire with vignette of Peterborough Cathedral and surrounded by descriptive text. Original colour. Description: Elegant map of Northamptonshire with original hand colour. Description: Miniature county map of Northamptonshire, showing roads and distances. Original colour.